Brent crude futures were down 1.8%, at $61.01 a barrel. 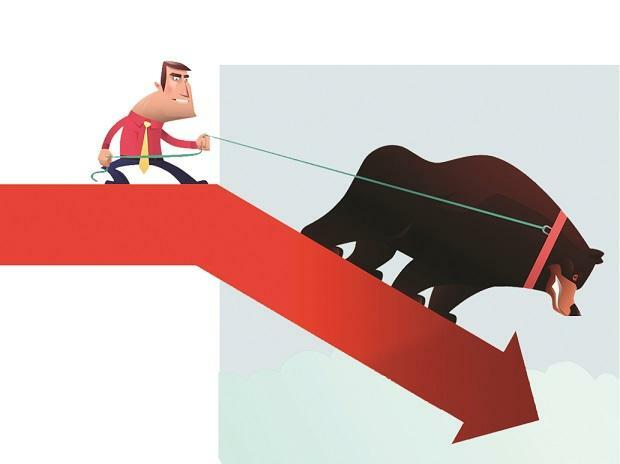 World shares fell into the red on Monday, with equities markets from Asia to Europe buffeted as Chinese industrial profits fell and investors stayed cautious ahead of a busy week including Sino-US trade talks and the Federal Reserve’s policy meeting. Major European bourses fell in trade, mirroring a retreat for Asian stocks as concerns over Chinese growth outweighed any boost from the tentative end to the US government shutdown late last week. Investors braced for another major twist in Britain’s exit from the European Union, with crucial votes due on Tuesday in the British parliament designed to break the Brexit deadlock. 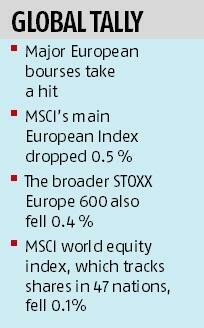 The MSCI world equity index, which tracks shares in 47 countries, fell 0.1 per cent, while MSCI's main European Index dropped 0.5 per cent. The broader STOXX Europe 600 also fell 0.4 per cent. “A slowdown in the Chinese economy could be sometimes taken as an idiosyncratic event, which would be dealt with by Beijing," said Philip Shaw, chief economist at Investec. "It's pretty clear that the current situation is more global, in terms of the tariff tension between the US and China and the threat of that dispute spilling over more widely." Earnings at China's industrial firms shrank for the second straight month, suggesting trouble ahead for manufacturers struggling with falling orders, job layoffs and factory closures amid a protracted trade war with the US. Investors are now waiting for Chinese Vice-premier Liu He's visit to the US on January 30-31, for the next round of trade negotiations with Washington. But with the sides still far from resolving trade issues, the dollar stood firm as traders sought a safe haven as they await news from US-China talks on Tuesday and Wednesday. The dollar index, a gauge of its value versus six major peers, was flat at 95.801. "In this environment the dollar was holding up well," said Thu Lan Nguyen, a forex strategist at Commerzbank. "I assume that this will continue to be the case, even as the conflict intensifies at the end of the week," she said, referring to the talks. The dollar will also get a strong steer from this week's Fed meeting, where the central bank is expected to signal a pause in its tightening cycle and to acknowledge growing risks to the world's biggest economy. Though the Fed has forecast two more interest rate hikes for 2019, a darkening global economic outlook and highly volatile stock markets have clouded the policy picture. Elsewhere in currencies, sterling drifted lower as investors consolidated positions ahead of crucial votes in the British parliament designed aim to break the Brexit deadlock. The British currency edged down a quarter of a per cent lower to $1.3164. Lawmakers earlier this month rejected Prime Minister Theresa May's EU withdrawal agreement, which included a nearly two-year transition period to help minimise economic disruption. That defeat set up a series of votes on Tuesday through which lawmakers and the government will try to find a way forward. Overnight in Asia, MSCI's broadest index of Asia-Pacific shares outside Japan was flat, with bourses in Shanghai, Hong Kong, Tokyo and Seoul all losing ground. Brent crude futures were down 1.8 percent, at $61.01 a barrel. Oil prices fell amid signals that crude output may rise further, and worries grew over the signs of economic slowdown in China, the world's second-largest oil user. Gold was slightly down. Spot gold was down 0.2 percen at $1,300.56 per ounce, hovering just below a more than 7-month high of $1,304.40 reached earlier in the session.